Our September Bulletin Board Ideas page will provide you with great resources for a number of monthly events, holidays and themes. Our bulletin boards will help you integrate seasonal activities into your daily curriculum. 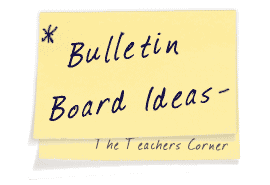 Ideas within the September bulletin board pages include resources for the following: fall and Back-to-School activities. A bulletin board that I have done ties into my Moonbear theme at the beginning of September. Outside of my classroom I have made a five foot Moonbear using my overhead. He is from one of his books where he is looking up into the sky. I use green paper on the bottom to make it appear that he is up on a hill. On my door which is covered in dark blue paper I have placed fairly large stars. On each star I have written the name of a student. I go over each name with silver glitter. It looks adorable if I say so myself!! The children love looking for their name. In October the scene changes and the children take their star home for their bedroom. This is an idea to remember September 11. Place a medium-sized US flag in the middle of the board. Cut out handprints in red, white and blue construction paper. Have the kids write their name and why they are proud to be an American on the handprint. Put the prints around the flag as if supporting it. Put the words "United we Stand" or "One Nation Under God" at the bottom of the board (use red, white and blue for the letters). Variation: Make the flag the size of the bulletin board and have the children write on the stars then use those stars to complete the flag.